The history of Chinese percussion instruments is longer than any other section of traditional Chinese instruments. Common materials used for making percussion instruments in the past were gold, rock, wood and bamboo. 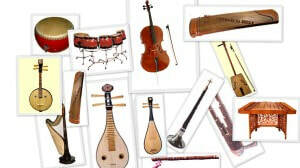 Because of the richness of the timbre, sound and variety of Chinese percussion instruments, they are also frequently used in Western-style musical compositions. Percussion instruments are usually considered easy to learn and perform. As many different percussion instruments produce different sound effects, it is frequently used in depicting joyful and exciting occasions such as harvests, marriages, as well as other traditional Chinese festivals. The percussion section is also the most important section in Chinese opera. The more popular percussion instruments include the lo (gong), bo (cymbals), gu (drums), and muyu (wooden block).